I’ve already covered the Rotating Speaker System from Sharper Image just the other day, but this next product from that company is for those who want to take their speakers out of the room, or even out of the house. The Indoor Outdoor Wireless Speaker comes in two main parts. The first is a transmitter that hooks up to your laptop or MP3 Player via headphone jack. This transmitter beams the sound to the stereo speaker (that you see in the photo) for a range of 160 feet. I had a chance to try it out for myself, and the speaker plays the “rich, full-range sound” that it advertises. 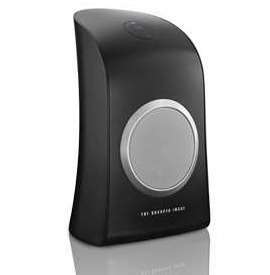 There is a volume control on top of the speaker, so the user doesn’t have to go to the transmitter to turn it up or down. It has a weather-resistant finish for when the speaker goes outside. That finish is probably good enough for a few splashes or some light rain. As for the dock itself, it seems to be made for an iPod or iPhone. I’m not certain why this dock is only AC powered, but the speaker can run off on 4 D batteries or AC power. The Sharper Image Indoor Outdoor Wireless Speaker is available on the now up-and-running Sharper Image site for about $69.99.